Every year dentists around the country see too many children with trauma to their teeth and mouths caused by a sporting injury. Many of these injuries could have been avoided if the child had been wearing a custom fitted mouthguard. Professional athletes wear custom mouthguards and the sooner children start wearing them, and see them as the norm, the better. There are different types of mouthguards available – off the shelf boil and bite types that you can get from sports shops or ones that are custom made and fitted by a dental professional. The Oral Health Foundation advise that custom fitted mouthguards from a dental professional are the safest and preferred option. 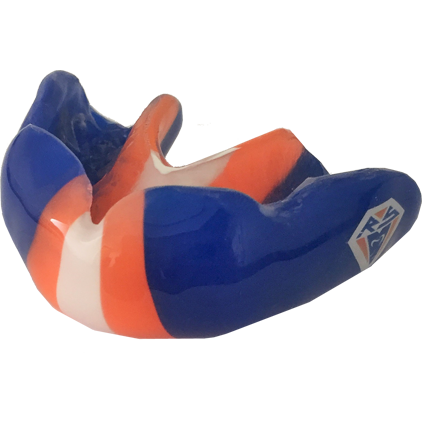 We understand that custom fitted mouthguards are more expensive than off the shelf options but would advise you to spend a bit more and get one properly fitted. It may sound a lot of money, but compared to a lifetime of dental treatment or the distress of tooth loss, it really isn’t. As a dentist and mother of 3 sons, I never allowed any of them to play contact or collision sports without a well fitted custom mouthguard and would urge other parents to encourage their children to wear one too. We are so passionate about this that our mouthguards start at just £25 for junior (primary age) children.